Property Size 1,722 sq. ft. The breathtaking views of the lake will be all yours from this terrific townhome overlooking the Graeagle Mill Pond. The redwood deck off living area offers a quiet and peaceful setting guaranteed to be one of your favorite spots to pass the time! 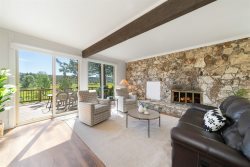 Upgraded flooring and granite countertops along with new furnishings add to the ambiance of this cozy mountain retreat. Vaulted ceilings and cathedral-style windows in the upstairs master suite echo the mountain charm all around you.